our road test with a light weight boat behind. Spartan, retro and expensive are words that spring to mind when describing the station wagon variant of the Land Cruiser 70 series commercial vehicles by Toyota. We test the top of the money GXL 76 series station wagon. It is a go everywhere vehicle provided you do not want anything like SRS airbags or automatic transmission or 'shift on the fly' or auto free wheeling hubs. So, if this is your type of vehicle read on for our view of this package. First up, let us try and sort out the vehicle name. In Toyota speak it is a LC 70, then comes the model designator/series/grade/body, Toyota Land Cruiser 76 Series GXL 4 door wagon. There you go, no more confusion. Right? Well, good luck with that. Toyota has long been one of the leaders in off-road capable vehicles. The subject of this report is no different, it is at home in the rough outback of Australia or suburbia but it needs a fair bit of room to manoeuvre. The turning circle is 12.6 metres curb to curb. With a kerb weight of 2,190 kg and a gross vehicle mass of 3,000 kg it has a distinct advantage of being a great tow vehicle with a braked towing capacity of 3,500 kg and 750 kg for the unbraked trailer. Our test machine was in fact fitted with an electric brake controller and a tow bar which we tested with a boat and trailer. The LC70 was not over burdened in this task; in fact, there was no distinguishable difference in the performance with and without our light weight boat/trailer. Download on the tow ball is more than reasonable at 350 kg. With a price of $59,990 (prior to the elimination of recommended retail prices) not including dealer charges and statutory charges, the GXL Wagon is expensive. At a price of $3,500 above the base model you get 5 alloy rims, chrome bumper and grille. Add to this power windows, snorkel, fog lamps, CD player with an AM/FM radio, MP3 compatibility complete with a power aerial with carpet on the floor and that is it. But wait, there is more, as you would expect for the big asking price. Yes, cloth seats and door trims form part of this package along with comprehensive instrumentation and engine immobiliser. Wheel arch flares are fitted, too. Air conditioning, metallic paint, diff locks front and rear are all optional extras. This vehicle's origin is dated back in the mid-80s and, unfortunately, not much has changed since then. The same basic layout of the dash with the large grab handle in front of the passenger where it will do most damage in the event of a severe head-on collision (remember no airbags, not even optional). I must say, though, the front bucket seats are very supportive and very comfortable. On the other hand, the rear seat is flat whilst the backrest is at right angles to the cushion and not at all comfortable. The rather large rear head restraints also obstruct rearward vision unless you are fluent in the use of the external mirrors. The 1980ish chassis is much the same too, although the wheel track has been widened to allow the engine bay area to be increased for the installation of the huge V8 turbo diesel engine. On the subject of the engine, this power plant seems to have an enormous capacity to loaf along at freeway speeds whilst not under any great strain at all. It returns reasonable fuel usage, the quoted figure by Toyota is 11.9 litres/100 kms for the combined highway/city cycle (in accordance with the accepted standard, ADR 81/01). Fuel capacity is 90 litres. The power plant carries the designator 1VD-FTE, which was introduced after the old 6 cylinder 1HZ plant failed to meet the Euro IV emission requirements. Maximum power of 151 kW is reached at 3,400 rpm, whilst the torque peaks to 430 Nm in the rev range between 1,200-3,200 rpm. It is basically the same the engine as fitted to LC 200 series, although twin turbos are standard with the 200. 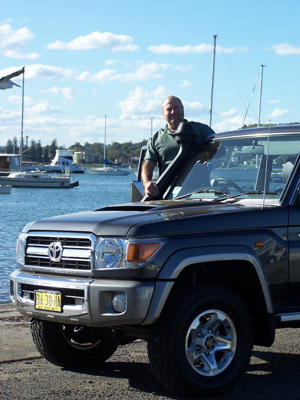 Overall, our week of testing the Toyota Land Cruiser 76 series wagon covered about 550 kms. 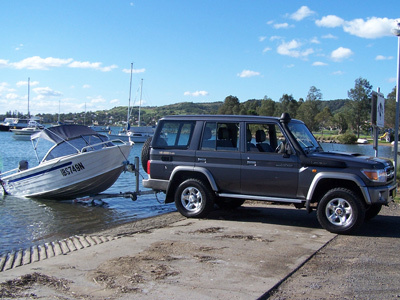 There was nothing that really stood out with this package except the huge price tag, the dated design, the effortless towing capabilities and the spartan approach to modern day comfort, conveniences and technology. It will sell though, and that's because it's a Toyota.